Nothing I do or say really counts if I haven’t had a clean heart while doing it.If not for the light of his grace I would fall quite short. I need to take a look at myself and see for myself the “high places” that have been building up around me. The ‘high places’ are where God should dwell, not anyone or anything else, but we end up constructing our own high places and in many instances, we take up residence there ourselves. God dwells on the high places but also WITH the contrite and humble in spirit. In the Old Testament many, if not most of the kings were content enough to dwell amongst ‘high places”, some built new ones, others continued to use old ones. High places were places of idolatry and sacrifice to other gods. Their hearts were divided and not truly sold out for God alone. When you think about it not that much has changed. We allow ourselves to live amongst “high places”, idols, and our hearts are also divided. We are human, yes. God does not expect perfection from humans, he provided the covering and payment for our sins to always bring us back to that vulnerable place in our relationship with him, where we are nothing and He is our all in all. The high places are where God could easily dwell all of the time, that is if He existed inside time, but he comes down to dwell with the contrite and humble in spirit. 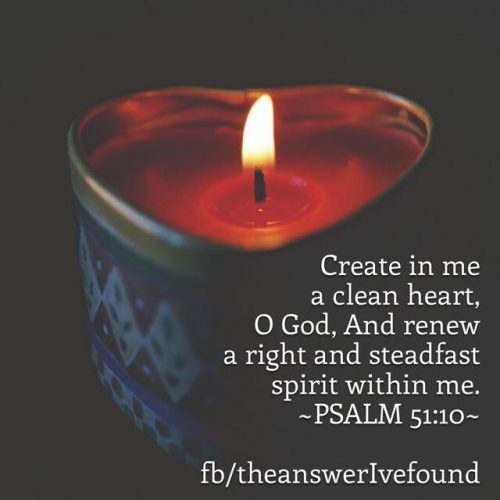 My prayer is to have a clean heart. I know it has not been exactly so. The journey that I have been on has been changing and strengthening me it has also given me a confidence that I didn’t have before. And in this, I am seeing where some of the impurities lie and it leads me to humble myself before him. I only see what I see because he has shown me. I humble myself before you. I recognize the humanity and my weaknesses. The goodness that’s in me is only a reflection of your awesome goodness. The wisdom in me comes from your laws, natural and spiritual. I am created in Christ Jesus to do good works which You prepared beforehand that I should walk in them. Lord all my good ideas are your good ideas. I defer to you. I declare that you are the author of all that is good in my life and that I am your willing servant. Cleanse my heart, my hands, my mouth, my ears, my eyes. Remove all impurity that would tarnish the glory that is due to only your Name. clean, Forgiveness, God, grace, heart, Jesus, life. Bookmark.